In the 1970s the U.S. Navy had a problem. The Soviets were building a big, powerful fleet of their own — plus surveillance satellites to help steer the new warships to their targets. In a war at sea, the Navy wanted to be able to take action against Soviet spacecraft. Fred Redding, Jr. of SRI International — an independent think tank in California — came up with something stone crazy: a manned, undersea-launched, recoverable space vehicle. A.k.a., a submarine rocket ship. This 40 years before the advent of modern reusable space planes such as the Air Force’s robotic X-37B. A fleet ballistic-missile submarine on deterrent patrol offered the perfect launch platform for Redding’s “High Performance Space Plane.” Redding seemed to assume that the missile’s orbital-insertion trajectory would not be interpreted by the Soviets as an Armageddon-triggering ballistic nuclear strike. The “High Performance Space Plane” at some point went from vague to exotically vague, becoming the “Space Cruiser.” Many of its features, from its orbital insertion atop a Poseidon C-4 to its external lines, were borrowed from existing ballistic-missile programs. In size the spacecraft’s dimensions compared roughly with today’s X-37B drone space plane. To fit in the tight confines of a nuclear missile’s launch tube, the spacecraft was hinged to fold in half for storage. Just how it would unfold was left unclear; perhaps divers would prepare the spacecraft underwater before launch. The proposed cockpit was reeeeally small; one early variant had the pilot fly the vehicle in orbit like the dashing young men who shot down King Kong — in an open cockpit with his helmet poking up through the fuselage. A major redesign spared the astronaut from enduring the boost phase upside down. Another oddity was the serious application of a rocket engine much studied but rarely flown: the aerospike. If a conventional bell-nozzle rocket is like a giant torch lighter, then an aerospike is like the gas ring on your stove top. It’s easier to throttle. If several jets clog up you can still cook (or fly). Plus it lies low and flat on the stove top. An aerospike engine can take up a fraction of the space a conventional rocket engine does for the same power output — and space is at a premium aboard a submarine. What tools and weapons might a warrior astronaut have available? Lasers and antennae to blind and buzz, grapples to catch and guns to harm. Guns? Yes, guns. 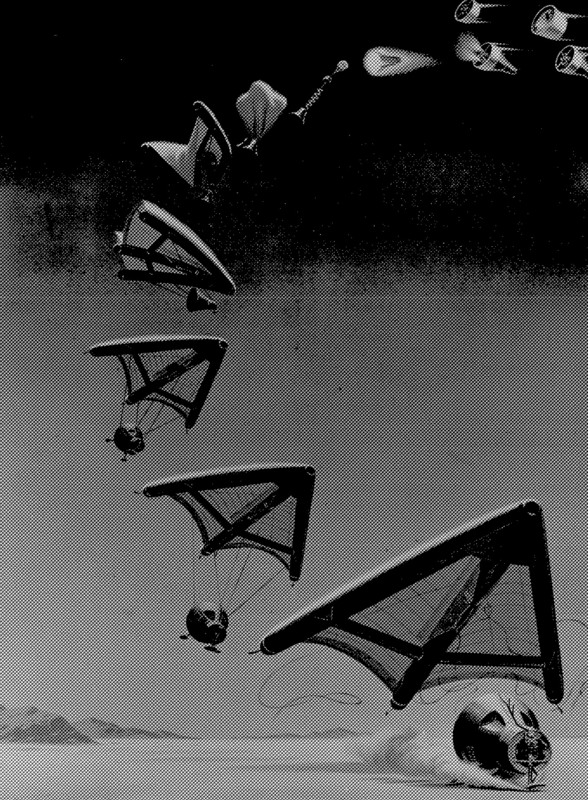 Because this was not (intentionally) a kamikaze vehicle, provision was made for a soft landing and recovery, presumably at sea, although the plan was for a folding parawing akin to the Rogallo wing designed for Gemini capsule recoveries. The aerospike engine had enough reserve power for considerable cross-range maneuvering, which increased recovery options. Political and budgetary realities kept many fringe space ideas developed during the 1970s from taking off. Others were simply rolled up when the Space Shuttle became The One True Way to Space. What became of the Space Cruiser concept is unknown, but an idea that zany was sure to give even the most imaginative bureaucrats the vapors. Steve previously wrote about the Navy’s scheme for a secret underwater lair.